(Bloomberg) -- Investor reaction to Canada's newly legal cannabis market took a brighter turn by late Wednesday morning, with a few stocks turning positive after the sector started the day in the red. Pyxus International Inc. led the gains, rising as much as 8 percent as of 11:25 a.m. in New York on higher-than-average volume. 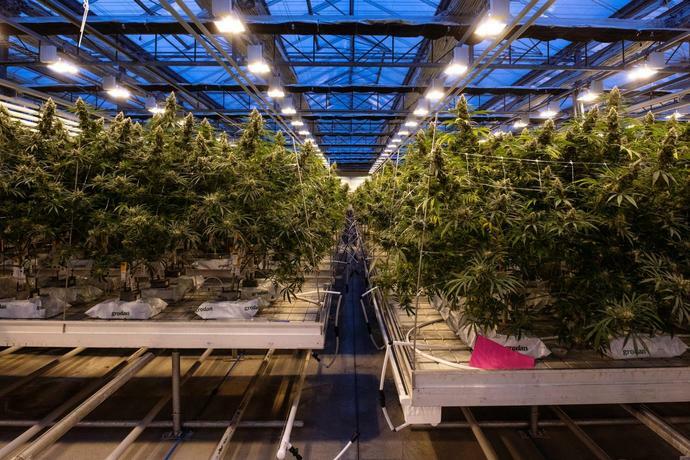 The agricultural company that supports cannabis and tobacco farmers was named by Citron Research last week as one of the potential beneficiaries of consolidation in the emerging sector. Aphria Inc. gained as much as 5.1 percent after Scotiabank said it was the best way to play the pot sector. MadMen Enterprises Inc. and Green Thumb Industries Inc also gained. Still, most of the sector remained lower as Canadians waited on lines for legal weed, with some complaining about the high prices. Shopify Inc., which is providing point-of-sale and e-commerce services to cannabis retailers, led declines midday, followed by medical pot producer Tilray Inc. Aurora Cannabis Inc. pared some of its worst losses after spending its own time as the biggest decliner in the space. The sector has been on a tear since mid-August on optimism ahead of Canada's move to become the biggest legal market for recreational use of marijuana. The ETFMG Alternative Harvest exchange-traded fund has added 62 percent since hitting its 52-week low on Aug. 14, while the Horizons Marijuana Life Sciences Index ETF surged 70 percent in Toronto.